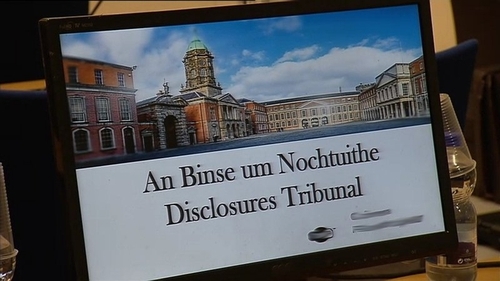 The Disclosures Tribunal has heard that nine out of eleven laptops issued to former garda commissioners Nóirín O'Sullivan and Martin Callinan, over a lengthy period, have not been returned to Garda IT. Superintendent Pat Ryan gave evidence that five laptops were assigned to Ms O'Sullivan between 2006 and 2017 and none of these were returned. He said she also logged on at three PCs and one of these hard drives has been located. The former commissioner was also assigned two iPads, both have been located although one had a fault. In relation to former commissioner Martin Callinan, Supt Ryan said he was assigned six laptops between 2001 and 2014. Four were not returned, one was re-allocated and the other was bought by Mr Callinan on retirement and reset to erase garda data. Supt Ryan said Mr Callinan used one PC and it is believed this was rebuilt and redeployed. He used one iPad but this developed a fault. Under cross examination by lawyers for the fomer commissioners, Supt Ryan agreed that laptops had a high degree of obsolescence. He also said that all laptops assigned to Ms O'Sullivan predated her time as head of the force. Supt Ryan also said emails on the garda system cannot be permanently deleted by the user. The tribunal also heard evidence in relation to a large scale garda IT project in 2014 which involved the replacement of all the computers in the organisation. This necessitated files on old computers being saved by the user onto a central file share system or elsewhere. Tribunal Chairman, Mr Justice Peter Charleton, said that he had visited the IT Centre at Garda Headquarters. The inquiry also heard evidence from the sergeant in charge of IT Live Operations in Garda HQ, Sergeant Declan Monaghan. Sgt Monaghan was asked about two dates in 2013 when former commissioner Martin Callinan was logged on to a computer which had access to the Pulse system. The tribunal heard the fact that Mr Callinan was logged onto the computer on those dates did not necessarily mean that he had logged on to the pulse system on those occasions. The tribunal heard there was no reason to suggest that either Martin Callinan in 2014, or Nóirín O'Sullivan since then, had migrated any data that was not in the central file share system. A sergeant from the Garda Press Office has told the tribunal that, while he was working under former garda press officer Supt David Taylor, he became suspicious that information from internal garda critical incident reports was being fed to a journalist. Sgt Damien Hogan said Supt David Taylor spoke to one journalist in particular, Eavan Murray of the Irish Sun, on a regular basis. Sgt Hogan said articles he read by Ms Murray seemed to contain a lot more information than he or any other member of the press office staff would have given out, and some articles reflected what was in critical incident reports. He said this gave rise to the suspicion that somebody who had access to the critical incident reports was feeding them to the journalist. Asked if the person he was talking about who was feeding information was Supt Taylor, Sgt Hogan replied that it was. Sgt Hogan said he believed this was improper due to the sensitivity of the information and the potential to compromise an investigation in the future. Sgt Hogan also told the tribunal that on one occasion in August or September of 2014, after Supt Taylor had left the press office, he received a call from a journalist about a CRI (Child Rescue Ireland) alert that had been issued. He told the tribunal that during the conversation the journalist said they were "getting enough from David Taylor at the moment". Sgt Hogan said he felt this was enough and that the Garda Press Office was being compromised. He said he contacted Director of Communications Andrew McLindon and then garda press officer Supt Paul Moran to let them know. Sgt Hogan also gave evidence that Supt Taylor contacted him to look for information about certain incidents after Supt Taylor had left the press office, and at one stage asked Sgt Hogan to forward certain emails his private email address. Sgt Hogan said this was not something he would have done. He also told the tribunal that Supt Taylor's relationship with some people in the office when he was working there became a little strained, and that he noticed an atmosphere crept in with certain members of staff that Supt Taylor did not like. Sgt Hogan told the tribunal that the relationship between Mr McLindon and Supt Taylor was not very friendly at all and that could be seen from day one. The tribunal heard that Supt Taylor was obsessed with timekeeping. Sgt Hogan said that Supt Taylor had introduced swipe card access everywhere in the office, including in the toilets. Tribunal Chairman, Mr Justice Peter Charleton, suggested to Supt Taylor's legal team that it might be a good idea if the superintendent was present at the inquiry to hear evidence about him. Mr Charleton said various "unpleasant things" were being said about him which were not generally being challenged by his lawyers. Tara Burns SC for Supt Taylor said they were in constant contact with him and he was being kept informed. Ms Burns said she did not have instructions to challenge on some of the matters in the witness statements of various members of the Garda Press Office, but they were taking further instructions. Supt Taylor is expected to give evidence next week. This afternoon, a garda press officer told the tribunal that Supt Taylor was uncomplimentary about Sgt Maurice McCabe and any journalist writing about him. Sgt James Molloy said that if there was a side to be taken on the issue, Supt Taylor was not on Sgt McCabe's side and the supt did not think well of the whistleblower. He said he was aware of a sexual assault rumour about Sgt McCabe and a suggestion the sergeant was upset because he felt it should not have been on the garda PULSE, but management were not taking it off. Sgt Molloy also said that he felt Supt Taylor had fallen into the trap of enjoying the media exposure that came with his role. He said the Superintendent went to every scene and stood in front of the cameras. He said he never picked up any hint of a smear campaign against Sgt McCabe. The tribunal has adjourned proceedings until tomorrow morning, when it will hear evidence from two witnesses from Forensic Science Northern Ireland. Former garda press officer Supt David Taylor is due to begin giving evidence next week. It is expected that former commissioner Martin Callinan will begin his evidence to the tribunal on Thursday of next week.